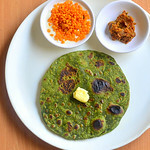 Palak chapathi (Spinach chapati, Pasalai keerai chapathi in Tamil) is an easy, healthy paratha recipe that can be served with onion raitha or boondi raita and pickle as the side dish. I make this easy palak chapathi for our dinner usually. 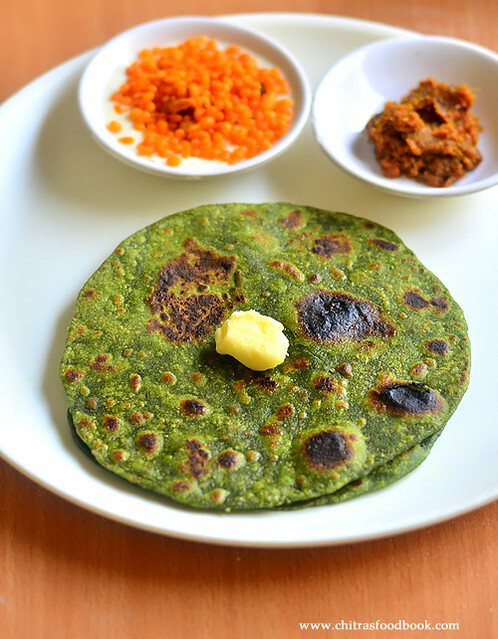 I followed my soft chapati recipe and added masala powders to make this spinach chapathi flavorful and soft. Curd & oil is the major ingredient that helps to make it soft. You can roll it thin or thick and pack it for lunch box if you like. You should eat it hot to enjoy its best taste. For variations, you can add finely chopped palak leaves and add it to make the job easier. 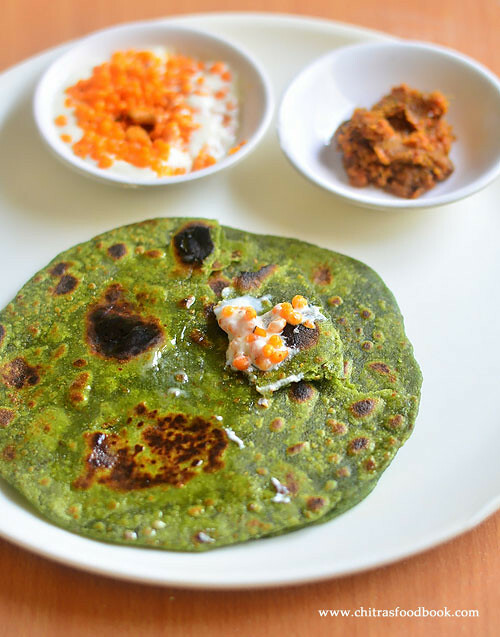 Lets see how to make easy palak chapati with step by step photos ! Wash and clean the palak leaves. Grind the leaves, green chilli and ginger to a smooth paste adding required water. Set aside. In a wide plate or bowl, take the whole wheat flour, ajwain, ground palak, curd, cooking oil, salt, garam masala powder and mix well. Add little water only if needed. Make a smooth dough.Knead for 5 minutes. Grease with oil. Cover & rest for 30 minutes. After 30 minutes, make ball sized dough and dust in wheat flour.Roll it thin or thick as you like. I rolled it medium thick. Heat a dosa pan. Put the chapati and cook in low to medium flame. When bubbles start to appear, flip the chapati and cook the other side. Apply oil on both the sides by flipping the chapathi. Remove and serve hot with onion raita or boondi raita. Adjust the quantity of masala powder as per your taste. 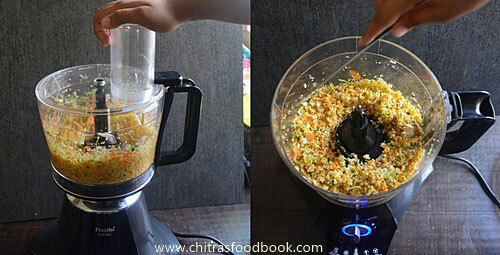 For variations, you can add finely chopped palak leaves, grated ginger & green chilli instead of grinding them. You can use cumin seeds instead of ajwain. 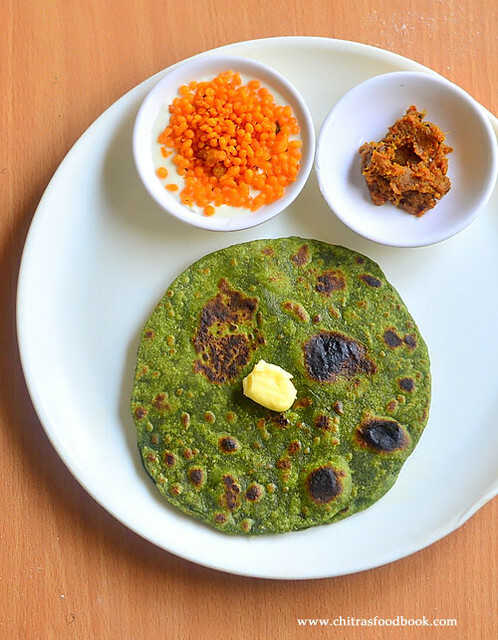 Easy, healthy palak chapathi is ready to relish with boondi raita & pickle. 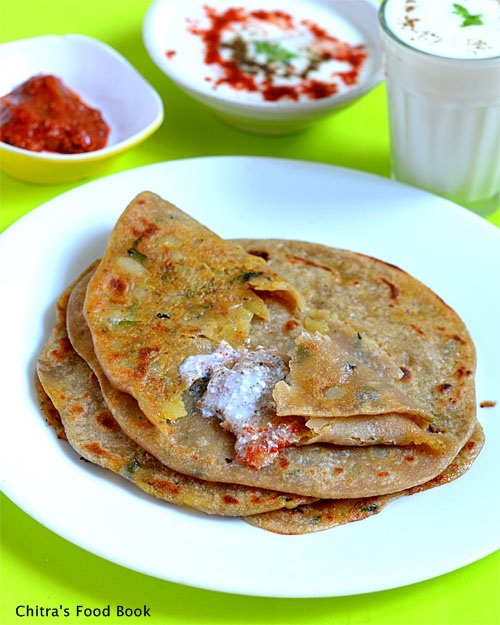 Radish paratha ( Mooli paratha, muli paratha in Hindi ) is a popular North Indian paratha recipe. It is basically a Punjabi recipe. Usually I make mooli paratha/ radish paratha by stuffing mooli masala in roti dough. 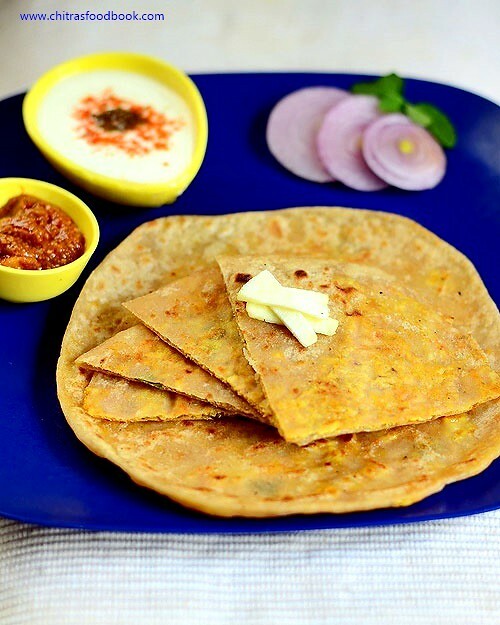 But recent days, I have been making mooli paratha without stuffing following this easy method as told by my friend Shalini.Its a no onion no garlic paratha recipe. In this method, I have added the ground mooli along with spice powders to the whole wheat flour directly. 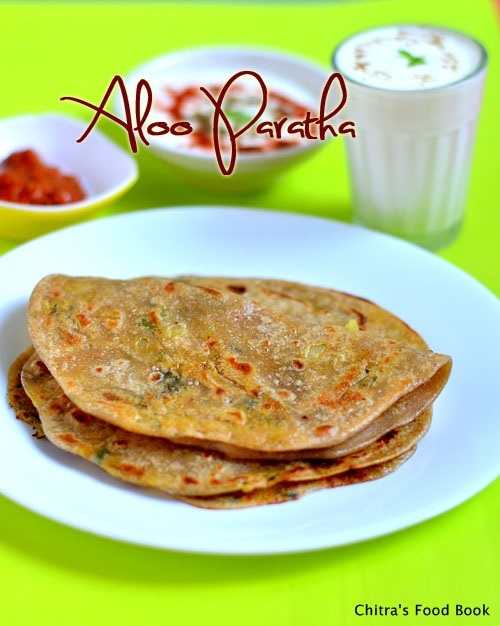 To make this paratha soft, I have added besan flour, oil and curd. 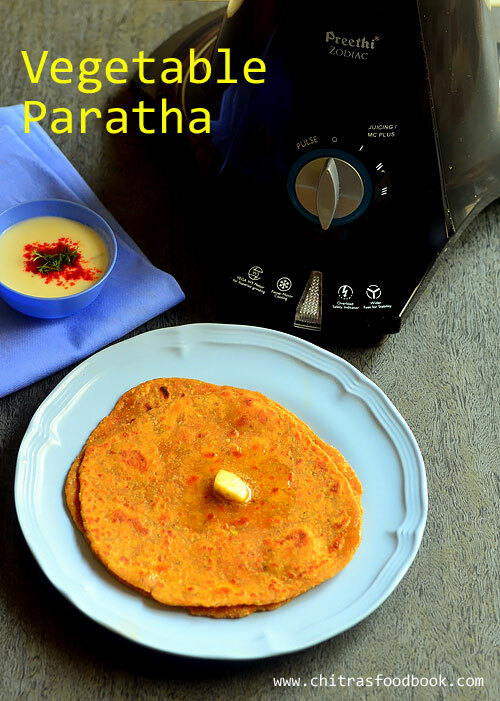 These ingredients help to keep this paratha soft for few hours. I have made these paratha thin as Sendhil loves this way. Make it thin or thick as you wish.Bachelors and working women will find this recipe very easy to prepare in busy morning hours or for dinner after coming back tired from office. 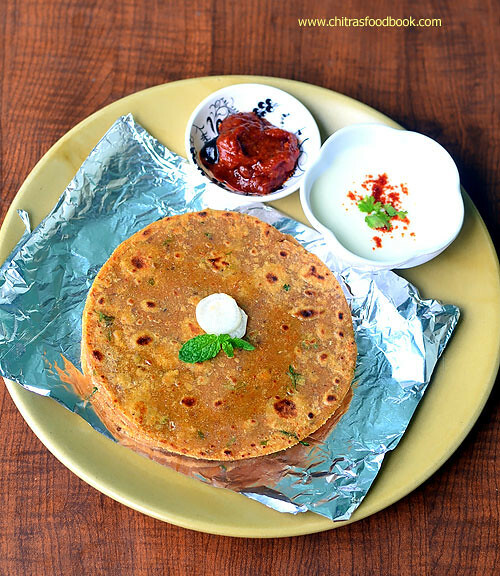 Onion raita , masala dahi or pickle would serve as a best side dish for this paratha. 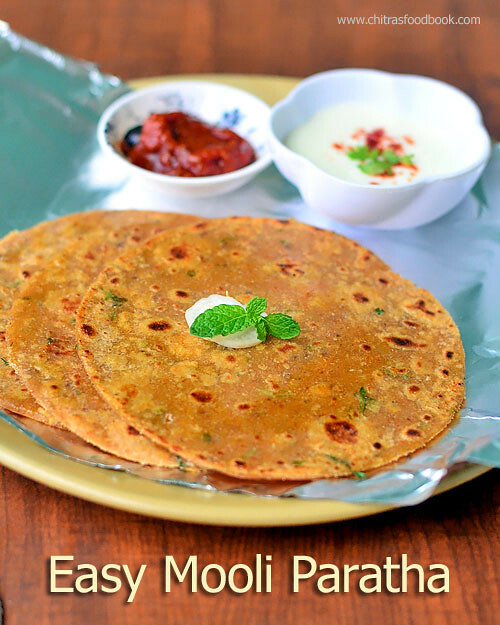 Friends, do try this easy mooli paratha recipe at home and share your feedback with me. 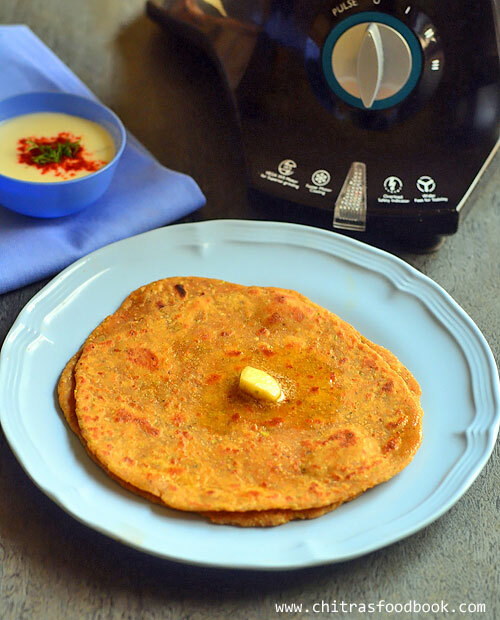 Lets see how to make this easy radish paratha / muli paratha with step by step photos ! 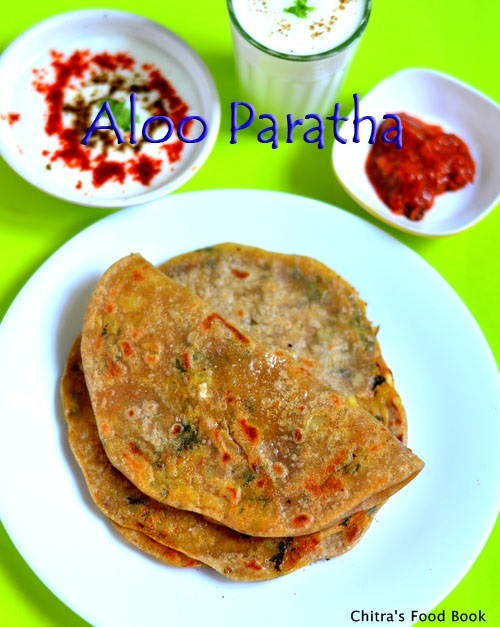 Mooli paratha ./ Radish paratha in an easy way without stuffing ! Wash and peel the skin of radish using a peeler. Discard the skin. Slice the radish into thin roundels. Grind them to a smooth paste without adding water. While grinding wipe the sides of mixie jar and grind for long time till radish becomes a smooth paste. If you do not want to grind the radish, just grate it using a fine grater and keep aside. No need to squeeze the water from it. In a wide plate, take the wheat flour, besan flour, cooking oil, curd , carom seeds, red chilli powder, dhania powder, garam masala powderand finely chopped green chillies and coriander leaves.Mix everything well to make a crumbly mixture. Now add the ground radish paste/ grated radish and mix well without adding water. Flour will become semi wet now. So add very little water using a tbsp measure and make a soft, non-sticky dough. Make sure you do not add more water. 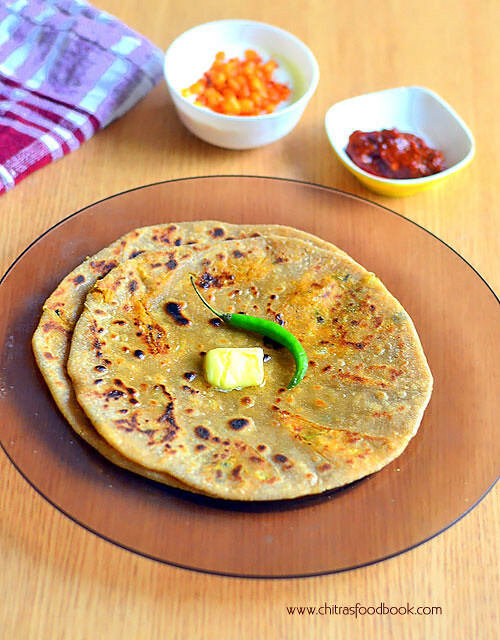 If the dough becomes sticky, paratha may turn out dry and hard. So add water very carefully. The quantity of water depends on the water content in radish. I used less than 1/4 cup of water. Grease your hands with oil and make golf sized balls from the paratha dough.Arrange them in a plate. Take one ball, dust in wheat flour and roll it to a thin or thick paratha as you wish. Paratha should not stick to the rolling pin. Do not use more flour for dusting. It will make the paratha dry even if you add more oil. Make all the paratha and keep them in a plate. 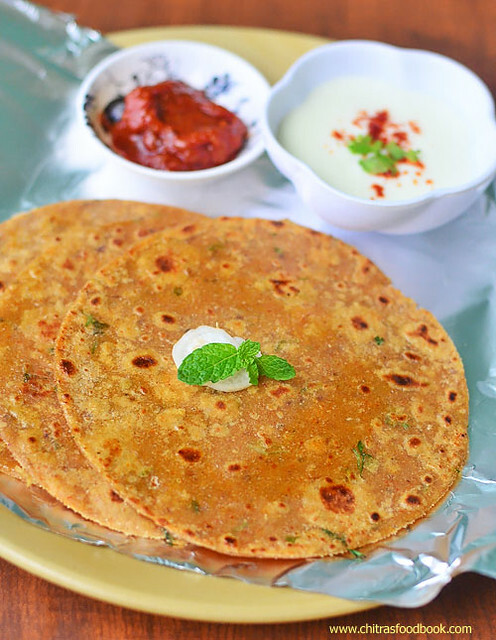 If you are not able to make round paratha, just roll the paratha to any shape, cut it with a round box lid. Heat a dosa tawa. When its hot, drop a paratha on the tawa. Keep the flame medium. Apply a tsp of oil or ghee all over the paratha, cook for a minute. Flip and cook the other side as well. Brush with oil. Cook both the sides till golden spots appear. Remove the paratha, brush with more oil or ghee if you wish. 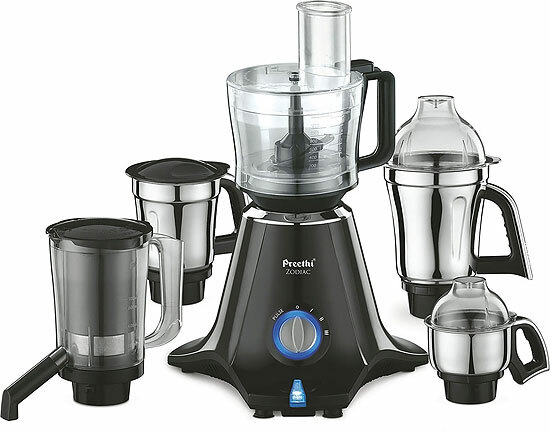 Serve it hot with raita and pickle to enjoy its best taste. If you are packing for lunch, just stack the cooked paratha one over the other, roll it in a thermal foil and keep inside the lunch box. Stays soft for few hours. Usually I make this paratha thin as per my family’s likings. Make it thick if you wish. You can replace carom seeds with cumin seeds. Adding besan flour is optional. You can skip it too. Adding curd and oil helps to make the paratha soft. Be careful while adding water. Add it little by little. The quantity of water depends on the water content present in radish. 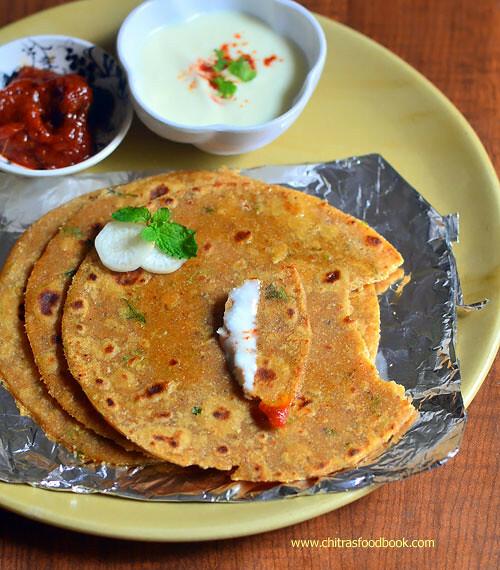 Enjoy this easy mooli paratha with a simple onion raita and pickle and relish a quick breakfast/ dinner !